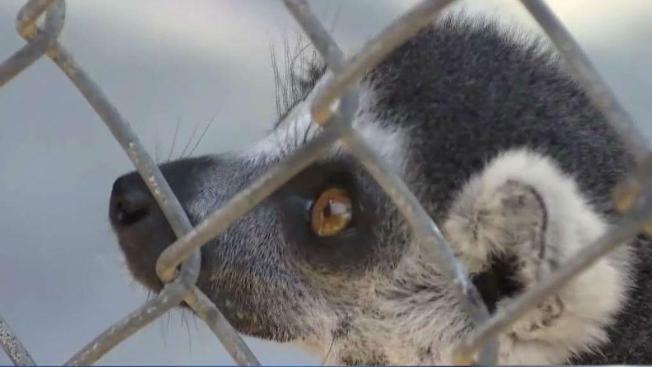 A lemur that was let out of its cage along with several monkeys at the Santa Ana Zoo was left in a crate outside a Newport Beach hotel, but who pulled off the caper is a mystery, a Santa Ana police spokesman said Tuesday. Sometime between when the zoo closed Friday and 2 a.m. Saturday, someone "hopped the fence, got into the zoo and with bolt cutters opened two cages with some lemurs and ... monkeys," said Santa Ana police Cpl. Anthony Bertagna. Santa Ana zookeepers and animal control officers managed to wrangle the capuchin monkeys back into their cages, but the lemur remained missing, Bertagna said. "While we were setting up a plan to start an area search of the zoo, we got a call from Newport Beach police" that the lemur was found just outside the lobby of a Marriott hotel in that city, Bertagna said. Isaac -- he's the zoo's senior lemur at age 32 -- was in a crate with a note attached declaring it had been stolen from the zoo and to call police, Bertagna said. "It sounds more like at this point that it was some kind of prank or a challenge because they placed (the lemur) in a public area in a secure box with a note," Bertagna said. Taking a lemur is a federal crime because the animals are listed as an endangered species, Bertagna said. All of the animals are back at the zoo and are OK, he said.